Rusty the Cowman is our release from Cornish Scrumpy & Western Band, The Cutlers. Released just in time for Christmas, the eight-track EP was recorded at Ocean Studios in Falmouth on 27th November 2007, and is the band's celebration of Christmas. The EP comprises four new and original songs, and four bonus tracks. The CDs are pressed and duplicated in Cornwall, and profits will be used to fund "The Cutlers of Cornwall" a 16 track album to be launched in the New Year. Some of the songs can be heard on the band's two MySpace sites www.myspace.com/cornishwurzels and www.myspace.com/powkernow so you can listen before you buy. Greg of The Cutlers has a warning message "Beware! If you listen to If Snowflakes Are Kisses From Angels on the Powkernow site, you will cry into your scrumpy thus making it too weak to drink." 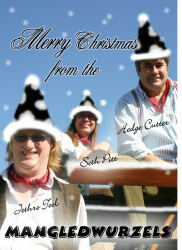 Merry Christmas from The Cutlers of Cornwall! Somerset-based Scrumpy & Western band The Mangledwurzels today released their charity Christmas single Stuff The Mangledwurzels in front of the local TV and press. The Official Press Launch Party took place at Bath Pavilion with the ITV West cameras filming the launch for the local news. Other press coverage, including Mendip TV will also be promoting the release. Sadly Nick Toms (RABI regional representative) was unable to attend the launch as his car broke down halfway from Plymouth and he only got as far as Exeter Services before having to be towed back down the M5! It was also a first chance for the general public (and indeed the band) to view the 12 Days of Christmas video which had been filmed and edited with animation by the students of Frome Community College. The video has now been uploaded to YouTube for everyone to enjoy! Meanwhile Mangledwurzels fans had already snapped up pre-release copies of the single at the The Mangledwurzels gigs over the weekend. An plea has already gone into our suppliers to press more copies! The single release is aiming to raise money for the Royal Agricultural Benevolent Institution (RABI), a UK registered charity (no. 208858). Stuff The Mangledwurzels EP is now on sale on CD and Download from our online store to be shipped in time for Christmas. On 5th November 2007, Tommy Banner will be celebrating forty years since he moved down from Scotland to join Adge Cutler & The Wurzels! Read the rest of Laura Thorpe's article '40 years of Wurzelling' on the Somerset County Gazette website. The rumours are rife, there have been goings on down in darkest Cornwall... it is all true! Today we are proud to announce the birth of The Cutlers. This is a three-piece band that is about to start raving about the classical delights of West Country music and humour. Comprising "Big Dave" on Keyboard and Accordion, "Big Bob" on Banjo, and of course "Big Greg the Tuba", yes this band is going to be "Big". Deep in training at the St Day Inn, The Cutler have already been booked for a CD at the recording studio of Chris "Billy Don't Be A Hero" Morris of Paper Lace. Final production will take place at Jethro's Digital Audio, and it should be available just in time for Christmas, when the band will also be releasing Rusty the Cowman as a free download single. This song is also being offered free of charge to any other Scrumpy and Western band that want it as long as any royalties are paid in good old scrump - the currency of kings! The band has a website at thecutlers.org.uk. Somerset-based Scrumpy & Western band The Mangledwurzels have teamed up with the Royal Agricultural Benevolent Institution (RABI) to release Stuff The Mangledwurzels, a charity Christmas single to raise money for farmers hit by the recent outbreaks of Foot & Mouth and Blue Tongue. The Mangledwurzels will be recording some suitably festive tracks at Handsome Llama Recording Studios in Frome at the end of October. One song will then be made into a video by students from the Media Department at Frome Community College which will be posted across the Internet to help raise the profile of the campaign, while another will feature a special local celebrity guest on vocals which the band have declined to name until the contract is signed! The band has chosen three songs for the EP – Santa’s Coming To Somerset, which is a self-penned song which always goes down well at the band’s Christmas gigs; Lonely This Christmas – the 1970s Mud classic with ‘mangled’ lyrics and the mystery celeb on vocals; and The 12 Days Of Christmas (Farmyard Version) – with new lyrics and the video by the Frome College students. Stuff The Mangledwurzels will be recorded on 28th October and is due for release in November. The band is currently looking for major sponsors to help boost the charity coffers. Anyone interested in making a donation should check The Mangledwurzels' website. 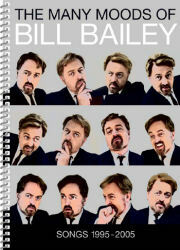 Well you asked for it...The Many Moods of Bill Bailey is the song book that you've been requesting for years, and collects 9 of Bill's most popular songs from the period of 1995-2005 with accompanying piano music, guitar tabs and lyrics. This collection also features introductions from Bill which gives us background to their creation, and an array of photographs and archive posters. The cover art, a 60s pastiche designed by Joe Magee, is also particularly resplendent, making this far more special than your average songbook, and a real collector's item. But the real attraction of owning this book is the knowledge that you will finally be able to recreate Bill's music in your own home. With music for piano and guitar, and complete lyrics, you have everything you need to bring these songs to life in the comfort of whichever venue you choose to play them. The Wurzels are back in the charts with their new single 'One For The Bristol City'. The Offical UK Charts for the week ending 6th October 2007, sees Bristol City FC & The Wurzels making their debut in the charts at number 66. This is the first time The Wurzels have had two singles in the charts in the same year since 1976! Fans were obviously hoping for a higher debut - a top 40 would be nice. All concerned are hoping that sales will continue and that the single will continue to climb up the charts and riase yet more money for the BUI Prostate Cancer Care Appeal. For more information, check the Bristol City FC website. Somerset Scumpy & Western band The Mangledwurzels have been booked for a special one-day Autumn Cider Festival at the Bath Pavilion on Friday 7th September. After the success of the 1st Bath Cider Festival at the Pavilion earlier this year in February, organiser Chris Lilley has arranged a special Autumn Cider Festival at the same venue. Full details have yet to be confirmed. The festival is the latest in a series of cider festivals run by CiderFestivals.co.uk, the brainchild of Bath Pavilion Catering Manager Chris Lilley. Following the outstanding success of the Bath Cider Festival at the Pavilion in February, Chris has now arranged similar festivals at Brighton, Frome and Norwich. Further festivals are being planned for 2008, although nothing can be announced yet. However, The Mangledwurzels have proved to be an integral part of the festival much appreciated by the festival goers; and the band has already signed up to any future events. Hampshire's favourite sons The Plonkers will be playing at a charity show at the Regent Centre in Christchurch, Dorset in November. The events is in aid of CODA Music Therapy Unit. The line-up includes Swing Unlimited, Bournemouth Concert Brass, Stromenti, and takes place on Thursday, 15 November 2007 starting at 7.30pm. Tickets are priced £25.00 family / £10.00 / £9.00 concessions. The box office is 01202 499199, and you should be able to book online closer to the date. 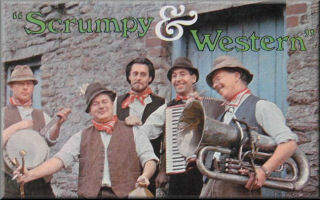 Somerset Scumpy & Western band The Mangledwurzels have been booked to open the inaugural Mumbles Cider & Pork Festival in August 2007. Featuring over 80 ciders & perrys plus local wines, a hog roast (or several!) and a selection of Welsh cheeses, the event takes place at the Ostreme Centre, Newton Road, Mumbles, just south of Swansea. This is also the band's first ever appearance in Wales! Tickets can be bought in advance on 07788 122132, or on the door. Doors open at midday, and last orders will be called at 11pm (Fri & Sat), 10.30pm (Sun) and 7pm (Mon). The ciders are being provided by CiderFestivals.co.uk.